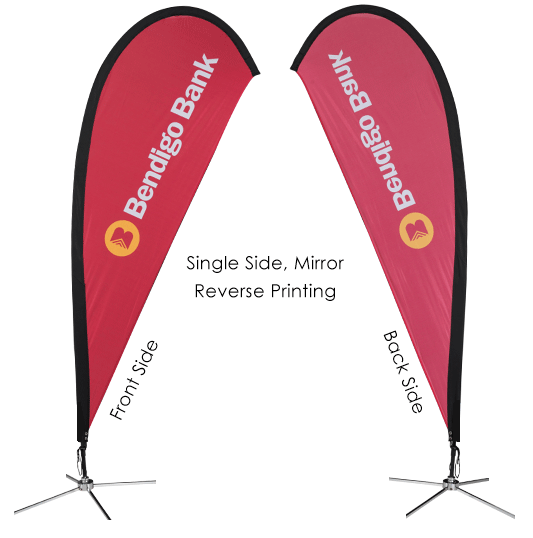 We have two printing options for our Teardrop Banners, Bow Banners & Rectangular Flags. Option 1 : Single Sided, Mirror Reverse For this option we print onto 1 piece of fabric that allows the ink to bleed through and show on the reverse side. This results in the back of the fabric displaying the printed artwork in a mirror image - with the colours being less vibrant. Below is an image that shows exactly how this looks. Option 2 : Double Sided Blockout This option is slightly more expensive as we print two separate pieces of blockout fabric from two different files, one for the front of the banner and one for the back. 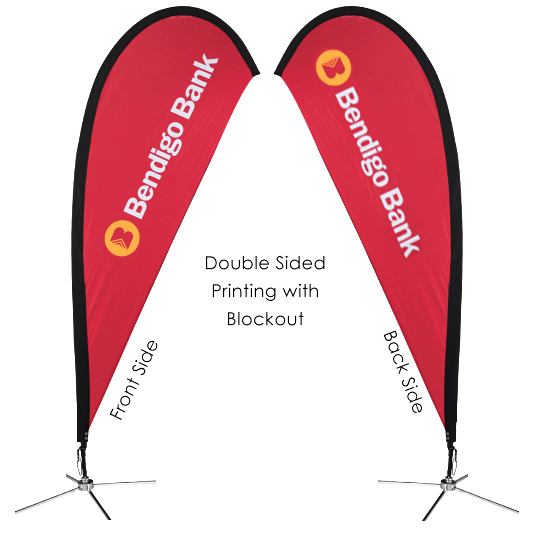 Our Signweave™ Blockout Fabric, that our double sided flags are printed on, ensures that the printed image on the reverse side will not show through. Both pieces of fabric are then carefully sewn together to create the double sided flag. This results in having the image on the banner looking the correct way from both sides. No matter which way the wind is blowing your design will always be seen the correct way. Below is an image that shows exactly how this looks. If you are not sure of the best printing method for your application, please contact our sales team on 1300 972 077. 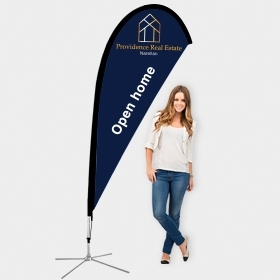 Get an instant online price (including bulk discounts) on a Bow Banner, Teardrop Banner or Rectangular Flag now.